V for Vendetta is a vitriolic vociferation of vengeance and villainy. Every once in a while a movie comes along with a lot on its mind. It’s not warm and fuzzy, it’s prickly and oftentimes uncomfortable. But the story it tells and the ideas it presents are so outrageous, subversive, spot-on, and controversial, sometimes all at once, the movie becomes a perverse joy to behold. Movies like Terry Gilliam’s increasingly relevant masterpiece, Brazil, and David Fincher’s Fight Club fall into this category. V for Vendetta qualifies as the latest entry in this special pantheon of anti-establishment filmmaking funded by well-established film studios. In the case of the latter, events begin way back in 1605, when Guy Fawkes was executed for attempting to blow up the Houses of Parliament. Thereafter, to celebrate the safety of the king, English folk light bonfires and fireworks on the night of November 5. Well, 400 years later, not much has changed. Terrorists abound around the globe (some of them have even been unwittingly voted into office) and England still celebrates Guy Fawkes Day (also known as Bonfire Night). In the not-so-distant future (at a time when events in the “former United States” make headline news), many take umbrage to what’s going on. One man in particular takes action. For the first movement of his explosive symphony, this man, who parades around London in a Guy Fawkes mask and goes by the code name “V,” blows up Old Bailey, London’s center of criminal justice. Immediately the spin doctors go to work, saying the destruction of Old Bailey was by design, a special, impromptu way to usher out Old Bailey in favor of New Bailey. V is rebelling against a hardline British government that fabricates news, covers up its own missteps, condemns godlessness, enforces color-coded curfews, hires fingermen, and imposes blacklists. And that’s on a good day. Yes. V for Vendetta has a lot on its mind. The docket includes censorship, subway bombings, avian flu, biological warfare, immunization testing on humans, homosexuality, and other subject matter that’s sure to get somebody somewhere all riled up. V (Hugo Weaving, The Matrix) is fond of quoting Shakespeare and demonstrating good old-fashioned chivalry. While on his way to blow up Old Bailey, he saves a damsel in distress, a young woman named Evey (Natalie Portman, Closer). Evey’s been fingered by the fingermen. Her parents were political activists and the apple never falls far from the tree. They will watch her and, if necessary, coerce her into submissiveness. Before she knows it, Evey is an accomplice to V’s affairs of the bomb, assisting in his escape following his next mission, the hijacking of the British Television Network. During his on-air spiel, V promises great things to come next year on November 5, when the Houses of Parliament will finally come tumbling down. There is a method to V’s madness; as the story unfolds it is revealed why he hides behind the mask, which in turn leads to the rationale behind his murderous missions. Weaving, who is always behind the Fawkes mask or other disguises, makes the most of his role and delivers an intriguing character without the benefit of any facial expressions. Portman takes on a British accent for Evey and does a fairly good job of humanizing her character, but whether she’s sporting long, curly locks or, as she does toward the film’s end, a shaved head, Portman never quite gets under Evey’s skin. Lending some good old-fashioned British acting power is John Hurt (Alien) as the heavy-handed, Hitleresque Adam Sutler. Director James McTeigue, who served as an assistant director on the Wachowski brothers’ Matrix trilogy and a host of other high profile projects, takes the lead this time and proves to be quite a formidable talent. While the pacing could use some adjustments here and there, in some respects V for Vendetta is like the works of V’s favorite author, Shakespeare. At first, it takes some time getting used to the timbre, but through acclimation and the course of events, those initially unnatural elements grow compelling and the ears eventually adjust. 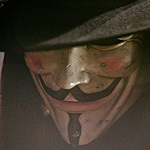 V for Vendetta is based on a series of graphic novels by Alan Moore and David Lloyd. Since Moore has sordid contractual issues with DC Comics and a general disdain for Hollywood, his name was removed — at his request — from the film’s credits, leaving Lloyd all by his lonesome. Moore has called the screenplay by the Wachowski brothers “rubbish.” Perhaps the man who saw his League of Extraordinary Gentlemen turned into a bottom-feeding spectacle has a reason to be bitter, but V for Vendetta has taken a different turn. In deference to Moore’s hypercritical analysis, however, no further comparisons will be made here between his graphic novels and the movies they’ve spawned. At the very least, V for Vendetta is a cautionary tale and a good, swift kick to the butts of both politicians and commoners, whether you’re British, American, or any other nationality. As V succinctly states, people should not fear the government, rather government should fear the people. Take that with a grain of salt; power in the wrong hands, whether they be serf or lord, is a dangerous thing. Amidst all of today’s real-world scandals and life-threatening forces, the timing for such a message couldn’t be better. Indeed, some of the subplots in V for Vendetta hit so close to home, the film’s release was delayed from its original November start, which had been planned to coincide with Guy Fawkes Day. Or maybe it’s as Warner Bros. claimed, that McTeigue needed time for some technical finessing of the movie. Whether it was that fine tuning or the fact that London’s Underground had all-too recently been the subject of a terrorist attack is debatable. It all depends on which spin doctor you choose to believe.